The word mnemonic is derived from the ancient Greek word mnēmonikos, meaning “of memory, or relating to memory”. A mnemonic or mnemonic device, is any learning technique that aids information retention. Mnemonics aim to translate information into a form that the brain can retain better than its original form. The use of mnemonic devices is based on the observation that the human mind more easily remembers spatial, personal, surprising, physical, sexual, humorous, or otherwise ‘relatable’ information, rather than more abstract or impersonal forms of information. Medical knowledge such as anatomy or pharmacology is rarely relatable so mnemonics are often used. The medical app called Cardiology Mnemonics developed by Rahul Gosain provides a series of mnemonics physicians can take advantage of. The user interface is simple and attractive. It provides us with five categories to select from such as Anatomy, EKG, Pathology, Pharmacology and Physical Examination. The individual entries show the mnemonic and a brief explanation on what they are referring to. We can bookmark those we find particularly useful. 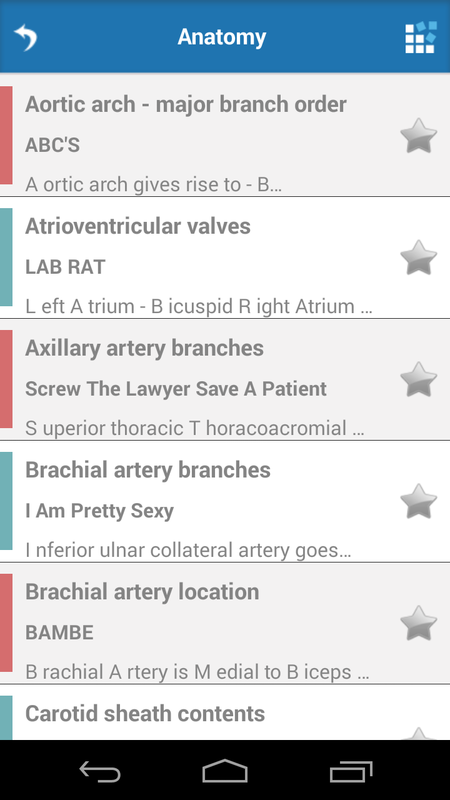 An interesting feature is that we can edit the available mnemonics and we can even add new ones. This is useful for those of us who make up our own mnemonics. It’s a shame the developer didn’t think of doing some sort of community based approach to the mnemonic database as that would have surely added a lot to this app’s value. 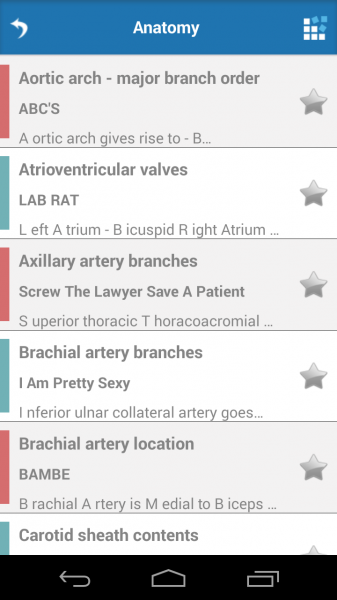 Imagine thousands of physicians around the world sharing their own mnemonics with the rest of us. The app contains no references to any source material. 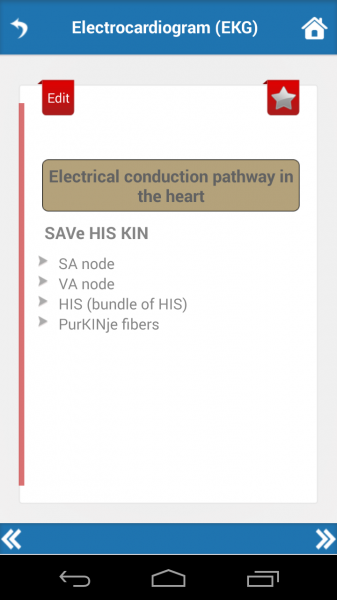 Cardiology Mnemonics is a good app with useful learning tricks. As was mentioned in the core article, it would have been better if the user had a way of sharing their own customized mnemonics but that doesn’t really subtracts from the usability and experience the app offers. 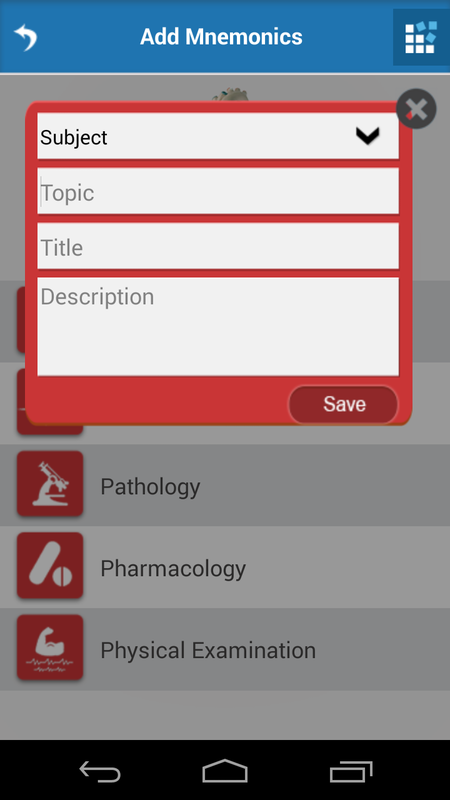 Users who find mnemonics useful will be able to take advantage of the app. 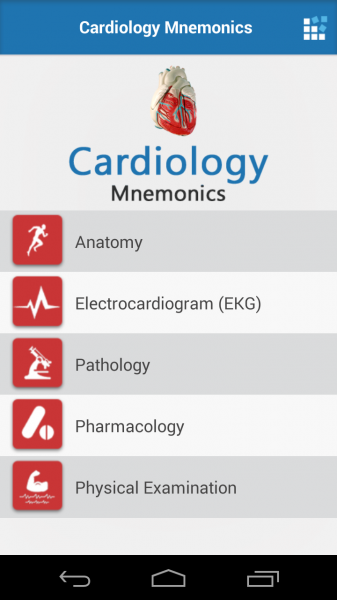 We appreciate your feedback on: Cardiology Mnemonics. We are glad to hear that the users like the simplicity and the data available. We do consider to have the option of sharing the mnemonics/”community based approach” in our next updated version (hopefully soon).